I expected a big adrenaline rush from the experience. Instead, I left relaxed, with a sense of calm, and a heightened awareness that with concentration, focus and keeping your “eye on the prize” you really can accomplish a hell of a lot. When I went to a shooting range in New York City, I thought it would just be something different and frivolous to do for my “52“. As I’ve stated before (see my Spy Day post), I have a fascination with intrigue, spies and all that cloak and dagger stuff. To continue to fulfill this silly fantasy of mine, I’ve always had an inexplicable urge to try my hand at shooting a gun. Let me just state for the record, I am the furthest thing you can get from a card-carrying member of the NRA. Very “anti-gun” actually, but the act of target shooting has always intrigued me. Even my favorite game at the carnival has always been to blow up the water balloon by shooting water into the clown’s mouth with the water pistol. I usually win too – I just love to concentrate, aim, and…squirt! So my friend Stacy, (she was also my partner-in-crime from rockclimbing) came along again and we ventured to Westside Rifle and Pistol Range . 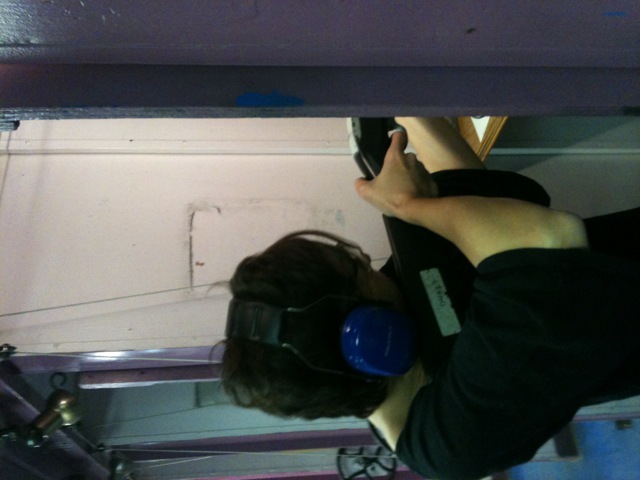 It is the only public shooting range in Manhattan and the one place in the borough where a person without a license can shoot a firearm. Since NYC (thankfully) has one of the toughest gun laws in the country you must have a handgun permit to fire a pistol. However, with the requisite background check and a mandatory safety course you are allowed to fire a .22 rifle. If we hadn’t known of our destination, we would have walked right by it. Tucked away amongst shops and the bustle of a busy NYC street, this truly clandestine hideaway emerges after you walk through a small, unmarked street level door and down a flight of rickety stairs to the basement of the building. I felt like I had entered into a time warp. But it didn’t end there — the cast of characters was straight out of a B-movie set and true entertainment in itself! There was John, our instructor- a small, squeaky fellow tattooed up to his neck with two holsters tightly strapped to his chest, who talked a lot about going to church; the big teddy bear of a guy with the foreign accent who you knew had lived a a thousand lives and had a story to tell behind his charming veneer (but you were afraid to ask what that story was); his “jack sprat”-like sidekick; the suburban housewife who came by to pick up the rifle she purchased for her husband’s birthday; those two suspect-looking dudes hanging back in the corridor; and the group of law enforcement types who came in with their instructor and took out the big guns (no, literally). They were the “real deal”. And then there was Stacy and me– she with the long blonde hair, California cute, and polished nails, and me. We both wanted to believe we were two-thirds of the Charlie’s Angels trio – was I Kate Jackson or Jaclyn Smith? Of course, Bosley was nowhere to be found and maybe we were a little older than the Angels, but one could dream. After filling out our forms, participating in the safety course, and manually loading 50 rounds of bullets into the magazines, I was handed a .22 caliber Ruger semi-automatic rifle. 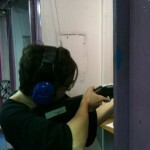 I definitely felt more like Annie Oakley than Angelina Jolie, but it would do. I put on my protective glasses (finally, the cool glasses!) and headphones (it really is deafening if you don’t wear them) and was taken to the “stalls”. The bull’s-eye and pug-nosed thug targets were hanging for us to aim at just like you see on TV. I used a bull’s-eye target and cranked mine in a bit closer than the 50 feet that’s suggested. It was my first time, after all. It’s very quiet in the gallery – bulletproof windows surround you and the headphones drown out the extraneous buzz all around. I was forced to be still, to slow my breathing, to really focus if I wanted to succeed at this. And succeed I did. The first few shots were pretty pathetic but once I found my rhythm and kept site of my target, I got the hang of it. I even shot a few in the bull’s-eye. It had this unbelievable calming effect on me. Of course, just as I really got the hang of it, it was time to go. I rolled up my souvenir bull’s-eye targets, cleaned up my shell casings, and quietly headed out. What began as a guilty pleasure and playful “spy jaunt” turned into a very different experience. I definitely don’t propagate the use of guns but I must admit I thoroughly enjoyed it and learned about myself from this little adventure. For me at least, I need to concentrate, keep steady and focused, and get out of my comfort zone. Then, when ready, look ahead and aim for it. The bull’s-eye is not as far off in the distance as I think.